Here’s how to change the speed of a video clip in Screenflow, either speeding it up or slowing it down. 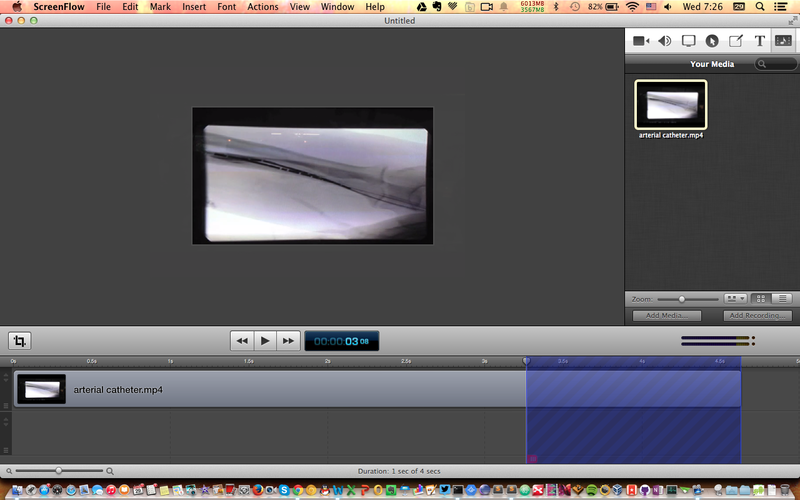 If you hover the mouse over the end of the clip, and press the Option button (Mac), then you will see a clock icon. Holding Option, drag the end of the clip right or left, making it slower or faster. You will see a popup with the time and speed hover over the end of the clip. Pretty easy right! I actually stumbled on this by accident. I hit some keys and it selected a part of my timeline and then I couldn’t get it ‘unselected’ or ‘deselected’ so I could export the whole video. Turns out its a simple keyboard shorcut. with a blue portion of the timeline ‘selected’ or ‘highlighted’. What I had done was accidentally press the keyboard shortcut "I", the letter “i“. This selects part of the timeline, or creates a “Mark In Point”. You can also do this by clicking Mark -> Mark In Point. Now, to get rid of this, simply type "control+z", or select Mark -> Clear In & Out Points. By the way, Screenflow is an awesome inexpensive video editor.